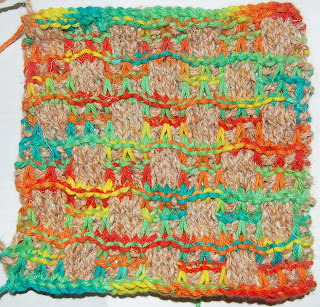 Craft Leftovers: The Perfect Dishcloth.... Knit Style! The Perfect Dishcloth.... Knit Style! I've been thinking for quite some time now that there was a need for a knit version of the perfect dishcloth. I really like it half felted, or even just with two different colors it looks really nice. It make doing the dishes quite a bit easier and quite a bit more enjoyable. Handmade kind of does that for me. And unfortunately this is a teaser. I completely forgot that I still needed to set up my server info on my new computer and can't get the pattern up. It is finished. Which makes it all that more annoying. The thing is that I honestly have no idea how to set it up and need to wait until Jason (my boyfriend who just happens to be the best guy ever) wakes up, which will be after I leave to work. I guess that means it won't be up until later tonight.